Why Does The Medical Industry Keep Missing It? With an estimated 27 million Americans who are suffering from Thyroid-related symptoms why does the medical industry keep missing it? 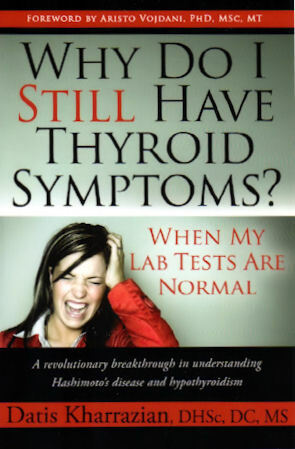 It is because they are trying to monitor the thyroid with only the lab result of TSH or Thyroid Stimulating Hormone. This is not enough information to know whether the thyroid is working or not. There are 22 sites of imbalances in Thyroid that can produce a normal TSH. Here at Essential Wellness we look at all levels to determine if your body needs support to heal itself in these areas and to optimize thyroid function. Every cell in the body has thyroid receptor sites with a need for thyroid hormones. Paulette Coates, Naturopath has been trained by Dr. Datis Kharrazian in mastering thyroid problems with natural solutions. His book shown above is highly recommended which is available at any book store. You can also take the sluggish thyroid test listed under the Body Restoration Technique. If you are suffering from 3 or more of the symptoms, please give me a call 720-581-1804 or e-mail me.